Two weeks before the end of the trip in South America and just a month before the long-awaited graduation in Rimini, we decide to visit for 10 days one of the most beautiful islands in the Caribbean Sea: San Andrés. Reachable by 1-hour flight from Cartagena, San Andrés is a territory belonging to Colombia and forms the department of San Andrés, Santa Catalina and Providencia. Despite it is not a destination for backpackers since it is quite expensive, we still decide to visit this paradise and we would do it again a thousand times! The island is very small and therefore there is not much choice in terms of hostels as most tourists stay in hotel or guest house (cabañas) generally more expensive. We choose to stay for 10 nights at El Viajero Hostel paying about € 20 per night in a mixed dormitory with 8 people (well above the South American average of around 5-10 euros a night). The first days rain a lot and we are able to appreciate a thousand shades of the sky and the sea after every storm. Moreover, the rain helps us to settle down and finally finish our master theses! Despite its small size, the island is a perfect destination for diving, snorkelling and outdoor excursions. 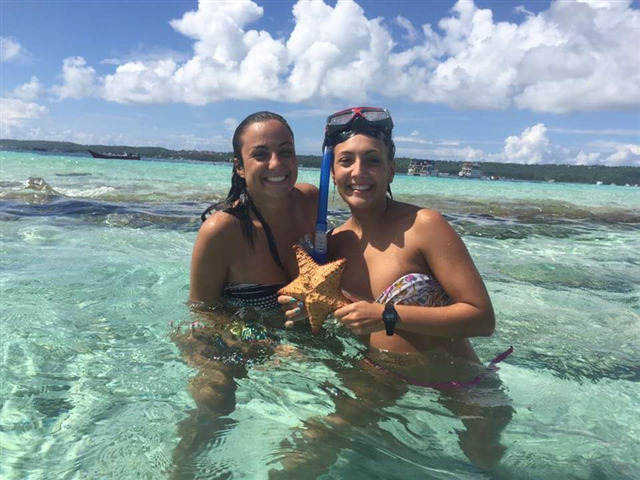 Together with 4 funny Italian guys from Lecce and 3 nice Brazilian girls, met in the hostel, we buy the boat tour to visit the amazing and crystal clear waters of Cayo Acuario and Jhonny Cay for an enjoyable snorkelling day. All for only 5 euros! In the first islet, as the name suggests, it is possible to swim with thousand coloured fish and starfish visible to the naked eye. Jhonny Cay, on the other hand, offers restaurants, white beaches and reggae music typical of San Andrés island. It has been a day in the spirit of exploring, relaxing and having fun, especially if with the right company (people is always very nice and friendly as everywhere in South America). The next day we decide to try for the first time to dive at 12 metres depth. We pay 40 euros for a diving lesson of about 1 hour, including a brief theoretical introduction and then the real diving. After few minutes of initial fear, we start to enjoy the moment and appreciate the peaceful atmosphere down here. Really a unique experience! To sum up, San Andrés is rich in breath-taking landscapes, Caribbean beaches, streets full of happiness, colours and music, good food and good vibes. We could not end our amazing trip around South America in a better way!